Pics from the UNTHSC Casino Night held at the Fort Worth Zoo are below. We had an excellent time blowing our fake cash on roulette. Why roulette? Because it was freaking impossible to find an open seat at the Blackjack tables, and the guy running Craps couldn’t count a 7 or an 11, making the game rather fruitless. After gambling it all on red, we decided to leave. Of course, we couldn’t just walk out of the Zoo. No, we had to wait 20 minutes to ride the kiddie train back to the entrance. We rode a fancified (stretch, according to Donald) golf cart on our way into the park. This was far too uncool for us to use to exit the park, though. After getting off the fridged train, we attempted to leave. We potentially may have dropped a torch on the ground, and possibly might have set off an alarm in the Primate house (note to Fort Worth Zoo, don’t leave buildings unattended with a bunch of eager grad students around), but we survived and made it back to the car without any casualties. After bumming around a bit at Ten, we wandered back to Ethan and Donald’s to watch portions of Dark Knight. I’m now quite tired and ready for sleep to eat pizza and then sleep. Yay pizza. Basically anything cheese related == goodness in my mind. 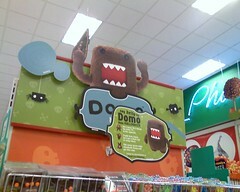 Domo has invaded Target, originally uploaded by andytrommer.